As a never ending jukebox. To create personalized, absolutely unique ringtones with just a few simple clicks. To generate ideas for fast and creative music composing. The program has two separate views. In the first, "Style" view, you select the style of music you want to create. The selection is made by moving the "Style" gauge to any desired value. The result is shown on the upper "Style Meter", with the green dial pointing somewhere in between the areas marked as "Rythmic" (mostly drums), "Pop", "Jazz" or "12-tone". 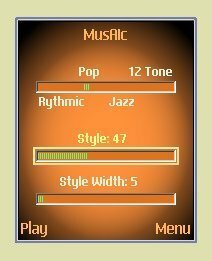 The "Style Width" gauge can be used to broaden the selection, including for example both "Pop" and "Jazz" style for the resulting music. Should you find a style area where the created music sounds especially pleasing, the settings of the style sliders can be saved and retrieved later on. The second, "Play" view is where you control the playing of the created music, using standard CD-player type controls. At the top of this view, you'll also find a gauge for rating each new song you listen to. The program uses this input to customize the way music is made. 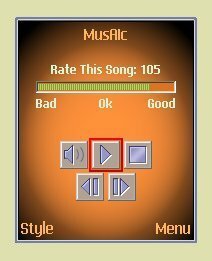 This makes every song completely original, created as a result of your rating input and the programs reaction to it. It is a learning process, so the longer you play and rate music, the better the program adapts to your musical tastes. At any time, all this amounted knowledge can be saved or retrieved, as a Virtual Composer. You can even �Marry� two Composers and find out what their offsprings� music sounds like. Each playing song can be saved for later retrieval and can also be exported as a MIDI file to your phones "Sounds" directory, where it can be used as a ringtone. Of course, you can also transfer this MIDI file to a computer and open it in a Sequencer program for any editing or enhancement that seems fit. Used this way, MusAic works as a idea generator for fast and creative music composing. The installation files for MusAic are around 300Kb, making them ideal for OTA distribution. Please go to www.musaic.info for more information on MusAic!